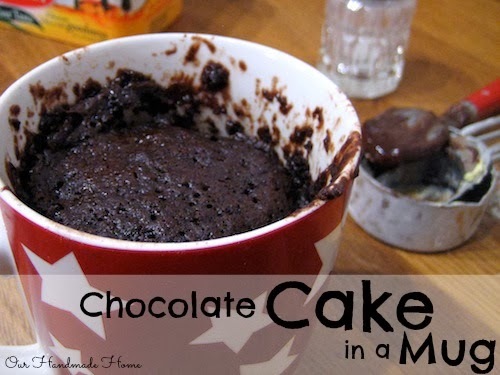 Instant - Chocolate - Cake! Whether you are sitting in alone tonight or sharing sweet nothings with the love of your life. Maybe you are even an anti-valentines person, well, lucky for you this cake is brilliant anyway and really has very little to do with Valentines, I'm just sharing it 'cause it is YUM! This is a chocolate cake of the instant gratification variety. I'm not going to pretend that it is as good as a Nigella Lawson Chocolate Fudge Cake (my personal favourite) but it takes 2 minutes to make it... literally 2 minutes from getting the flour out to shoveling it into your face... 2 minutes!!! HEALTH WARNING - Please eat yummy cake responsibly. Microwave on full power for 1min 40seconds. This is from a recipe I pinned a few weeks ago, but I have altered it to improve the flavour. I'm off to snuggle down with Mr McG and a mug of chocolate cake and watch some Carry Grant movies. PS. I've been busying away in the back rooms of the blog making it all pretty. I'd love to hear what you think. Also, if anyone is interested I'm launching advertising and have some great deals on right now! I have discovered u by accident and since my husband and my son dont share my love for cakes , baking has been out of the window for a while now , but this recipie needs no sharing so will give it a try.